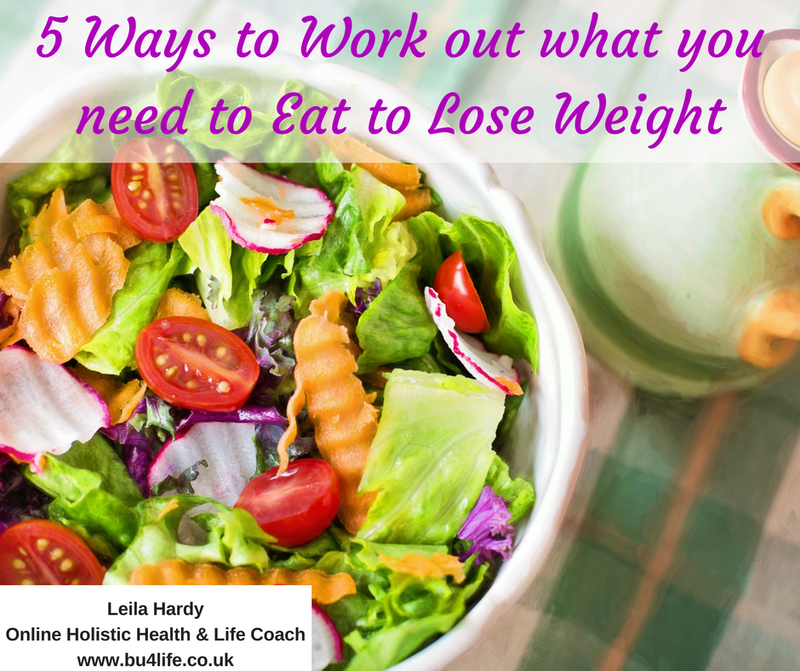 Leila Hardy here, checking in with you today to provide you with five ways to work out what you need to eat to be able to lose weight in a really efficient and simple way! One of the biggest things I coach anybody who wants to lose weight is to start to develop their own intuition when it comes to learning about what to eat, educating themselves what suits their body, because there is no 'one-size-fits-all' in every sense of the word when it comes to what to eat, not to mention the fact that we are all human beings who are unique in our own makeup and how we are built and how well we digest things. But also in the very fact that we have at least four different seasons in a year as well, so our body is going to have different requirements for those different times, not to mention the fact that the nutrients in the food that we take on those different times are also different. So it is really important that you work out what works for you and what feels good for you. I am all about making it so simple, so easy to follow that you’re like, “I never realized that it could be this easy!” And you start to understand that simply being able to tune into your own intuition when it comes to learning about what to eat, how to eat, when to eat, where to eat etc., that you can really feel empowered to be able to go through your weight loss journey in those ways. 1. We’re looking at the physical aspect of this and really focusing on foods that follow the four “R's”. These are foods that could be eaten RAW, foods that ROAM or grow, foods that are RECOGNIZABLE, and foods that ROT quickly. What that basically eliminates is anything processed and anything that has been preserved with extra salt and sugars. And it is absolutely no coincidence that we are able to, calorific-wise, really eat the most of those kinds of food. This is because they fill our plates, they are full of color, and they are lean proteins and healthy in every sense of the word. It is no coincidence that the amount of the four “Rs” you can have is huge compared to the amount of processed foods you should and could have if you are following a calorie-controlled diet or just in any way of life really. 2. Keep a food diary. When you start to look in black and white at what you’re eating, when and how you’re feeling afterwards, you can start to build an incredible picture and pattern as to what may be occurring in your body digestive-wise, blood sugar-wise, and energy levels-wise as well. It gives you the opportunity to really look at what’s occurring when you eat what you eat and around why you eat, not to mention the fact that it brings the presence of mindfulness into looking at what you eat. Because when you have to write it down on paper honestly and authentically, it makes you think very differently about what you are putting in your mouth as well. If you know that actually you are an emotional eater or you’re not eating the right foods, then you know why you’re not losing weight and a food diary is a really powerful way to be able to change that and to transform life for you. 3. Using muscle testing to be able to test which foods serve you, which foods don’t serve you, which ones weaken you, and which ones don’t weaken you. This gives you the opportunity to be able to work through the seasons in an empowered way because your body will change. Those needs will change. And when you are aware of that, you start to also then become observant of the things that were working really well for you six months ago are no longer working for you to help you lose weight. That is because something may have shifted in your body and changed in your body through the seasons or through something changing literally physically, in your body. When you can muscle-test in these situations and in general, you can work with that in an intuitive way to really help guide you towards the foods that are working really well for you, as opposed to ones that aren’t serving you anymore. That doesn’t mean they’re permanently not serving you if they’re great healthy foods and you’re surprised that when you muscle-test they don’t work for you anymore. It just means right now they’re not serving you so there’s an opportunity for you to really expand your food vocabulary into all of those foods that you know are going to be incredible for you to experiment with and try and taste and sample in order to be able to lose weight. 4. Eliminating things: When you are able to take certain things out of your digestive system, out of your food intake for a period of three weeks or longer, you get to strip back that internal canvas of yours. When you start to either re-introduce that food or similarly if you’re already noticing that you’re feeling amazing without that food in your life not putting it back in at all, but if you are able to re-introduce that food and you start to notice instantly how it makes you feel, it doesn’t feel so good, the you know that you actually eliminating that food from your way of eating is going to serve you really well. It’s a bit of a slower process; it is a little bit of experimentation. And of course if you take lots of things out all at once, only put one thing back in at a time so you get to see which one individually is working or not working for you. Because if you take lots of things out all at once and then put lots of things back in all at once, you’re not going to know which ones are serving you and which ones are not. Give yourself that opportunity to be patient with that journey as well. 5. Working with energy but using a pendulum to be able to test your foods with a clear blank slate of intention to be able to just assess without any judgment, any preconceptions, which food are good for you and which are not. You have the opportunity to use a pendulum to test which foods work for you and which don’t. If you have a pendulum, give yourself the opportunity to work with that. Play with it with some “Yes/No” questions to see what works for you, what direction the pendulum moves in, and then start to use that over foods or with foods in your hands to be able to test that. 1. Following the four “Rs”- recognizable, foods that roam or grow, foods that you can eat raw, and foods that rot quickly - they’re not processed. 2. Keeping a food diary - checking out in black and white what leads to certain things going on in your energy, in your body, feelings, your digestion, your wind, your bloating, or anything like that. 3. Muscle testing - an opportunity to really test which foods physically and energetically weaken your body and strengthen your body. 4. Eliminating foods out of your diet to be able to start integrating them back in or leave them out completely if you know that they don’t agree with you and you want them out of your life. That’s just five ways to work out what you need to lose weight. There are many other ways, but I love to keep it simple and engage the whole of you in the process of losing weight, not just simply following a plan or diet. If you have questions about these methods, or want support on your weight loss journey, then don't hesitate to get in touch!